knowth and newgrange. | spielwiese. next post: altar by sunn o))) and boris. september 8, 2007 at 23:51 by felix. i’m back now. back home, in zurich. and we have been out yesterday, and it was wonderful, the weather being great, as great as it hasn’t been probably for a long, long time: the sun was shining bright, it was warm, and the places we visited on our trip were absolutely beautiful. we’ve been at brú na bóinne, visiting the passage graves knowth and newgrange. passage graves are basically hills with a tunnel (the passage) going inside, reaching finally a chamber, the grave itself. both of them are over 5000 years old, therefore being older than the pyramids in egypt. 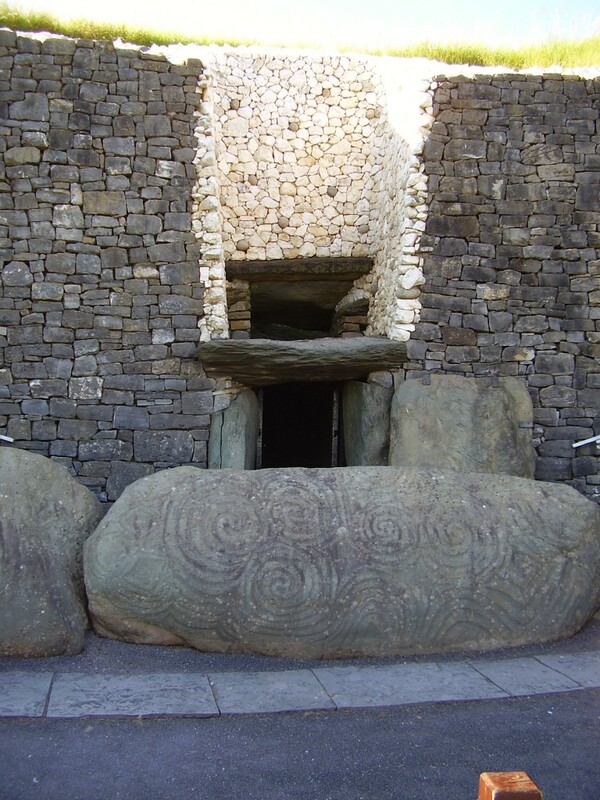 more interesting is the fact that newgrange’s inner chamber is completely dark all the time, except on midwinter, when, in case the sun isn’t blocked by clouds, it shines through a window over the tunnel into the grave and lightens it up a bit for around 17 minutes in the morning. it is amazing that such a long time ago, people managed to build this up with such a precision. on our visit, we had the chance to enter the grave, and to get a tiny impression of this event, using electric light instead of sun beams. first, being completely dark inside, one sees light crawling onto the floor, slowly increasing, the shattered photons adding some light, allowing to recognize the room’s structure, the other watchers, and, according to our guide, even their faces and colors of the inside. then, the light slowly fades away, the darkness crawling back out of the holes, covering everything. the only color left being black. pure absence of light, for another 364 days, 23 hours and a lot of minutes. or even for millennia, when entry stones fell down, blocked the way inside for the sun. today it’s different, though, electric light allowing tourists to see something, to wander around in this grave, appreciating its construction, gazing at the decoration carved into the stones, the spirals. then, finally, being out again, the view of the landscape feels so beautiful, the green much more intense, one is happy to have escaped the blackness. now, feel free to enjoy some views on these places.